What Is A Hammer Drill and Why Do You Need the Machine? If you are familiar with drilling works then you know that, it is possible to drill concrete and hard masonry objects with a normal drill. However, it will take a longer time and a lot of efforts to make few holes. So, when you are required to make a bunch of holes on the concrete walls or you are working in construction project, it is unwise to use normal drills for drilling concrete, bricks and masonry. Hammer drills come handy as they offer faster and easier drilling on hard concrete and masonry objects. So, what is a hammer drill? Let’s find out! You may have seen a lot of drills and question yourself about different types of drills. 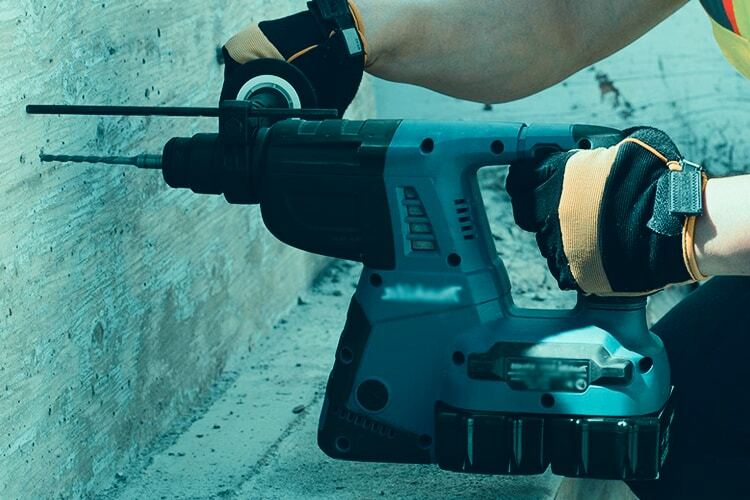 If you are looking for a drill that can penetrate the concrete wall easily, then you need a hammer drill. Now you are wondering about the fact, what is a hammer drill? A hammer drill is a kind of drill which is well-known for hammering action. Hammering action refers to rapid and short hammer thrust shatter and make holes into hard materials. It also provides faster drilling experience with relatively less effort. Hammer drills are generally electrically powered with dedicated direct power cable. Of course there are also some hammer drills that operates on Batteries. A hammer drill is often equipped with strong masonry bit or hammer drill bits for drilling into concrete, stone, mortar and brick. A hammer works like normal drill while drilling even the hard surface with a forward hammering action. There are several manufacturers who provide quality hammer drills. Among them, DEWALT hammer drill and Bosch hammer drill are good choices if you want to buy your own hammer drill. You may know what is a hammer drill, but not all of them. There are different types of hammer drill, especially normal hammer drills and the dedicated rotary hammer drills. Rotary hammer drills are more powerful when it comes to penetrate toughest object. Regular hammer drills are found in both corded and cordless form. Rotary hammer drills are often called the dedicated hammer drills for their mechanism and powerful performance. Rotary hammer drills are more advanced “Electro-pneumatic” hammer drills as they use Electro-pneumatic (EP) hammering mechanism. It is powered by directly connected electric source rather than battery or uses any air compressor. Old rotary hammer works with the hammer without the rotation function. However, most modern rotary hammers have both hammer function and rotation function and you can use them separately or in a combination. There are drill mode, hammer mode and both. Rotary drills are used generally when there is a lot of masonry or construction works to do. Drilling holes in stone and masonry is easily possible with rotary hammer drill. For doweling purposes you need a bigger rotary hammer. Normal hammer drills are lower power drills compared to the rotary hammer drills. These hammer drills operate on using percussion or cam-action mechanism. Normal hammer drills are smaller in size and a lot are designed with cordless technology. These hammer drills utilize rotation with or without hammering action. The “Cam-action” mechanism uses rotational speed and does not allow the hammer action only to drill. These hammer drills are not suitable for large scale drilling like in a construction drilling. However, for occasional concrete and masonry drilling these drills are perfect and handy to use. A corded hammer drill is very much useful when you can draw electric power from nearby. It is comfortable if you consider the fact of charging battering and carrying extra weight. Corded hammer drills are also more powerful and offer more RPM (Rotation per Minute) than cordless one. Cordless drill comes handy if there is no direct electric source nearby. Cordless hammer drill comes with rechargeable battery to operate the drill. If you do not require drilling a lot of holes at a time this cordless drill is a nice option to have. The old models of cordless drill operate at a lower speed than corded drill, but most new models with 18+ Volts batteries provide similar performance of a corded hammer drill. Impact Driver and Hammer Drill are two different things. Many people confuse them because of their similar shape and working principles. However, they are for different purposes. A hammer drill is not made for screw driving and for this reason, you should not use hammer drill for driving nuts, bolts and screws. For driving nuts and screws you need a different tool and that is the impact driver. Impact driver increases the rotational drive through impact action. This rotational impact helps to excel screw driving but not the drilling. You should not use an impact driver for any kind of drilling purposes. These are designed only for nuts, screws, bolts and nags. We sometimes may need to make holes on concrete walls for wall plugs, concrete screws and anchor bolts. A hammer drill does these drilling faster than any other drills. A hammer drill uses a specially designed mechanism that allows the drill bit not only spin but also punch in and out simultaneously. This hammer action is fast and offer thousands of IPM (Impacts per Minute). Together with the rotational force, this hammering action easily pulverizes concrete bricks and masonry objects. So, for quick and easy drilling on concrete and hard materials hammer drill is the ideal choice. Do you have still confusion about what is a hammer drill? We hope not. We believe you are now well aware of hammer drills, their working principles and uses. For any other question, please write to us. Happy Drilling!